In mid-March, Mississippi’s Department of Marine Resources and Governor announced two new oyster projects that will be funded by the Gulf of Mexico Energy Security Act (GOMESA). The Act periodically directs revenue from oil and gas production and leasing in the Gulf of Mexico from the U.S. Department of Interior to Mississippi, Alabama, Louisiana and Texas. Congress allows GOMESA to provide a stream of revenue back to the states and separately to the Land and Water Conservation Fund that all states may apply to use. One new GOMESA-funded project allocates $1 million to Mississippi for spreading hard “cultch” material on coastal water-bottoms. This material includes clean oyster shell, rock or crushed concrete dropped to the bottom from barges to make hard beds onto which drifting larval oysters can settle, attach as tiny oyster “spat” and eventually grow to maturity. The other new project provides $3 million from GOMESA toward the planting of juvenile oysters attached to shell or rock on prepared bottoms or active reefs in coastal waters. The oysters will likely be grown from the spat stage in controlled conditions like aerated tanks before being moved. Bags of seed oysters settled on shell or rock can be transported offshore and placed on reefs on the bottom, or grown suspended in baskets or racks. Either way, this results in more young oysters getting a start in Mississippi waters. 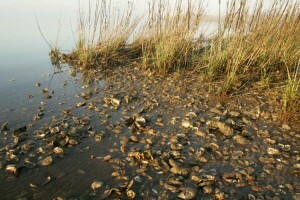 Oyster reefs provide hard structure in coastal waters and marshes that otherwise have mud bottoms. Reefs attract marine life, starting with the smallest organisms in the food chain. Many invertebrates like crabs, shrimp and worms dwell, shelter and feed in the spaces between oysters. Small bottom dwelling fish hide among oysters, and schools of small fish are often attracted to oyster reefs. Larger predatory fish congregate over oyster reefs to forage for the smaller prey animals. Oysters feed by filtering water for detritus and plankton and so improve water quality. They also stabilize shorelines and reduce erosion. The Atlantic coast oyster population is estimated at less than 10 percent of its historic size. Gulf oysters have fared a bit better, although hurricanes, habitat changes, and the BP oil spill disaster have stressed the oyster resource in recent years. Still , a rebound is possible, with some states showing progress in recovering oysters in recent years. Mississippi’s total oyster production and commercial harvest have been declining over more than a decade. Harmful impacts to oyster production and health include Hurricane Katrina, the BP oil spill disaster, and the repeated openings of the Bonnet Carre Spillway, including March 2019, that divert massive amounts of Mississippi River floodwater away from New Orleans into Lake Pontchartrain and the western Mississippi Sound. Prolonged exposure to low salinity water during spillway openings is harmful to oysters. Mississippi convened the Governor’s Oyster Council in 2015 to investigate a path toward recovery for the state’s oyster industry, and a recently formed state oyster task force at the Mississippi Department of Marine Resources is now working on implementation. The GOMESA projects can ultimately increase the abundance of mature spawning oysters and of free swimming oyster larvae: if more of them find suitable hard-bottom habitats, settle and survive to mature in Mississippi coastal waters, the state’s oyster production can improve. Andrew Whitehurst is the water program director at Healthy Gulf and covers Mississippi water and wetland issues. He is the great-great grandson of J.B. Ewell, an oysterman/shipper and truck-crop grower at World's End farm on Lynhaven Inlet/ Virginia Beach, Va.